Geoffrey Robinson (he changed his name to Dawson in 1917), the eldest child of George Robinson, banker, and his wife, Mary Perfect, was born at Skipton, Yorkshire, on 25th October 1874. Geoffrey Dawson was one of a number of young Oxford graduates whom Milner had recruited to work in the administration of the new colonies. William Thackeray Marriott described them as "Milner's Kindergarten". The group included John Buchan, Lionel Curtis, Richard Feetham, Fabian Ware, Robert Brand, Basil Temple Blackwood, Patrick Duncan, Geoffrey Robinson Dawson, Philip Kerr and John Hanbury-Williams. All the men saw the unification of South Africa as the key to economic prosperity. 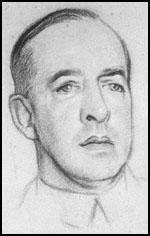 In 1938 British intelligence was becoming very concerned about the activities of Princess Stephanie von Hohenlohe, a close associate of Geoffrey Dawson. A report said: "She is frequently summoned by the Führer who appreciates her intelligence and good advice. She is perhaps the only woman who can exercise any influence on him." They also reported that she seemed to be "actively recruiting these British aristocrats in order to promote Nazi sympathies." (PROKV2/1696). Geoffrey Dawson died at his home, 24 Lowndes Street, London, on 7th November 1944. Princess Stephanie was a regular weekend guest at Cliveden, the home of Lord and Lady Astor, as notes she wrote herself confirm. The Astors' house parties became notorious for attracting members of aristocratic society supportive of Hitler and his policies, and for enthusiasts of appeasement. Lord Astor owned both The Observer and The Times, Geoffrey Dawson, editor of The Times, was another of Princess Stephanie's acquaintances and also regularly attended at Cliveden.The house parties were therefore fruitful occasions for Stephanie to work her brand of subtle propaganda: persuasive, clever conversation which traded heavily on her personal contacts with Hitler. 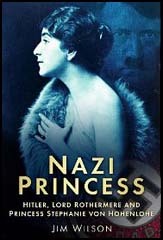 She was to later write, in an effort to distance herself from her energetic dissemination of Nazi propaganda in London in the 1930s: "It is true that at Cliveden a number of recurrent guests were those in favour of appeasing the new Germany, but appeasement was by no means a bad word at that time." Ribbentrop, a regular visitor to London even before he was appointed Hitler's ambassador to Britain in October 1936, became one of the most sought-after party guests in the capital. He was a natural social climber, and dressed to give the impression of being the perfect English gentleman. He liked nothing more than rubbing shoulders with royalty and aristocrats, and was frequently seen in London's most fashionable circles with ardent pro-Nazis like Emerald Cunard, Lord and Lady Londonderry and others in Wallis' and Princess Stephanie's circles. Princess Stephanie's work with others who agreed an alliance with the new German regime was the way forward, and led to a campaign to form influential organizations, working within British society, who were sympathetic to the Nazis. Prominent names stand out as having common connections or membership with several of these organizations.The Link, which received financial backing from Berlin, included many members of the Cliveden set and of the Anglo-German Fellowship, though on a more modest scale also encompassed members from the Cliveden and London house parties. Stephanie and Ribbentrop were both regulars at Cliveden weekends, and in a report to Hitler on Anglo-German relations written in December 1937, Ribbentrop described the Cliveden set as a group trying hard to impress on Chamberlain the need to really understand Germany and Nazi policy. But he said they were being sidelined by unconditional opponents of Germany, in particular from hostility within the Foreign Office. The famous Times leader of 7 September, putting forward the idea of the cession of the Sudetenland, caused a furore not only in its own letter columns but throughout informed circles, even though the article was merely a continuation of the paper's established policy. Opinion was strongly divided between those who "broke out into a volley of abuse", including most of the other newspapers, and those who believed that it was "the only feasible solution", and that it was "better for the peace of Europe that this comparatively homogeneous block of German-inhabited and German-speaking territory should be joined on to Germany". 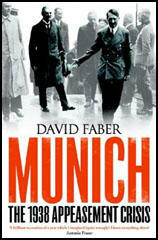 There were many facets to the debate, but almost all were on the plane of appeasement versus firmness. Sir Arnold Wilson called for negotiation, Sir John Fischer Williams stressed the urgency of the situation, stating that "Prague must be brought to see that it must take the only possible course without further delay's Sir Frederick Maurice offered the services of the British Legion to supervise the orderly evacuation of territory. But there were few public statements of a pro-German nature at this stage of things, except, of course, in biased journals such as the Anglo-German Review and The Patriot. From 1935 to 1939, the political leaders of this country were, with the exception of Winston Churchill and Leo Amery, frightened men. With the shining exception of the Daily Telegraph, the press too was bright yellow. Under the leadership of The Times (Dawson and Barrington-Ward) Fleet Street, from Right to Left, did everything in its power to help Neville Chamberlain and his wretched Government turn the whole country yellow. Even Kingsley Martin, the editor of the New Statesman, who had written so vehemently about standing up to the aggressors, buckled over Munich - and was later ashamed of it. Churchill's supreme achievement, amounting to a miracle, was to turn the British in 1940, within a few weeks and single-handed, once again into a brave people; and, by so doing, to save western civilization.